Hansa Jayadeva dispels whatever archaic notions one might have about yoga teachers. She is vivacious, confident, articulate and very stylish! She runs The Yoga Institute, Santacruz, jointly with her husband Dr. Jayadeva, whose father Shri Yogendraji founded it way back in 1918. This makes it one of the oldest international yoga foundations in India. The Jaradevas are a study in contrast. She is the practical doer; he, the shy retiring thinker. In spite of an age difference of 19 years between them, the Jayadevas present a unique whole. Dr. Jayadeva with a doctorate in philosophy and psychology, ideally suited to his retrospective self-effacing nature, has had a brilliant academic career. Hansa on the other hand has had more than her share of scholastic ups and downs. She was forced to give up her cherished career in medicine, due to severe asthma. Swallowing her disappointment, she enrolled back to college, completed her B.Sc. and studied law as well. She also pursued her interest in classical music by learning classical music by singing as well as the sitar. Throughout this period, the asthma was a constant factor in her life. When all remedies had failed, she finally joined The Yoga Institute. Here, her instructor was none other than Dr. Jayadeva. Seeing her prowess in the most difficult asanas (which she had been practicing since childhood) he encouraged her to join the advanced teachers training course that the Institute had to offer. Here, for the first time Hansa was exposed to the theory behind each asana. She learnt the various elements that went into making yoga such a complete science and in the process of learning, her asthma vanished. Magically or so it seemed. It hasn’t recurred to date! Her decision to marry Dr. Jayadeva was heavily opposed by her parents. He was so much her senior and did not come from an equally affluent background. And anyway wouldn’t she be happier married to some green card holder? But Hansa was adamant and the marriage took place. Now began progressive years for the institute, under the charismatic guidance of Hansa, ably supported by Dr. Jayadeva. The first thing she did was to streamline the residential course, mostly frequented by foreigners. Till then the Institute had only offered them lodging, while they had to fend for themselves for their daily meals. Hansa changed all that. She installed a hygienic kitchen, where the students were assured of fresh, wholesome food. She also restructured the residential courses so that each day was meticulously organized and given to constructive activity. She was instrumental in starting a yoga research department as well as setting up a library and a museum in the premises. Her activity has not been confined to India alone. Since 1974, she, along with Dr.Jayadeva, has conducted Yoga workshops and seminars in various countries of the world, including Australia, Canada, Europe and the U.S.A., gaining support and admiration all the way. Not being content with international acclaim, Hansa set her sight on popularizing yoga amongst Indians. 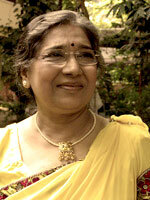 To gain the vast audience she had in mind, there was only one medium – Doordarshan! Her program, ‘Yoga for Better Living’, was being telecast every Wednesday and Sunday mornings on the national network and had even received an extension due to popular demand. In spite of the heavy demand on time, she is forever innovating and restructuring the various programs at the Institute as well as introducing new courses, be it for working women or one specially crafted for cardiac patients. She still finds time to lecture advanced students and play table tennis. Certainly not a stereotype yoga teacher as we said earlier and we’re sure you agree too!